In the early years of the First World War, the Bolton Journal ran a regular feature ‘Mothers of England’, featuring local women who had a number of sons in the forces. Sadly, many of these ‘brothers in arms’, whose youthful faces smiled out from the pages of the newspaper, were never to return to their hometown. 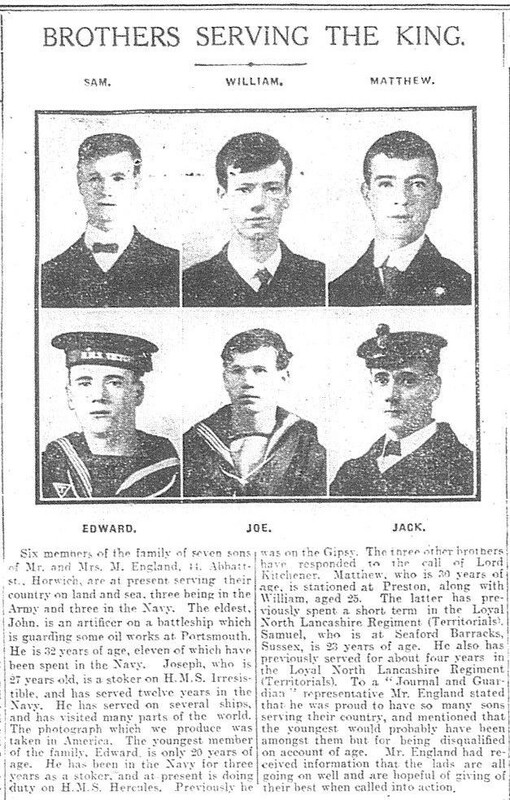 The patriotically named England brothers featured in the Journal of 9 October 1914. Matthew, Joseph, John, William, Samuel and Edward had all joined the Colours shortly after the outbreak of war. Younger brother James was to join up later in the conflict. All were the sons of Matthew England of Horwich and his late wife Elizabeth, who had died in 1911. One of the brothers, William, a Private with the Loyal North Lancashire Regiment, was killed in France on 25 November 1915, aged 25. Also featured in the same edition of the Journal were the five sons of William and Mary Harris of Radcliffe Road, Haulgh. Jack was serving in the Royal Navy on HMS Temeraire, having enlisted in 1912. Brother Harry had been with the 5th Battalion of the Loyal North Lancashire’s for four years, whilst William (Duke of Wellington’s West Riding Regiment), Arthur and Robert (both Bolton Artillery) had joined up at the start of hostilities. All were to return home, but youngest brother Cyril, who joined up in January 1915, aged just 17, was badly wounded in 1917 and then taken prisoner in March 1918 dying at Freidrichsfeld PoW camp on 26 September 1918, his 21st birthday. Printed memorial cards in an album pay sad tribute to the three Davison brothers of Rose Street, Bolton. 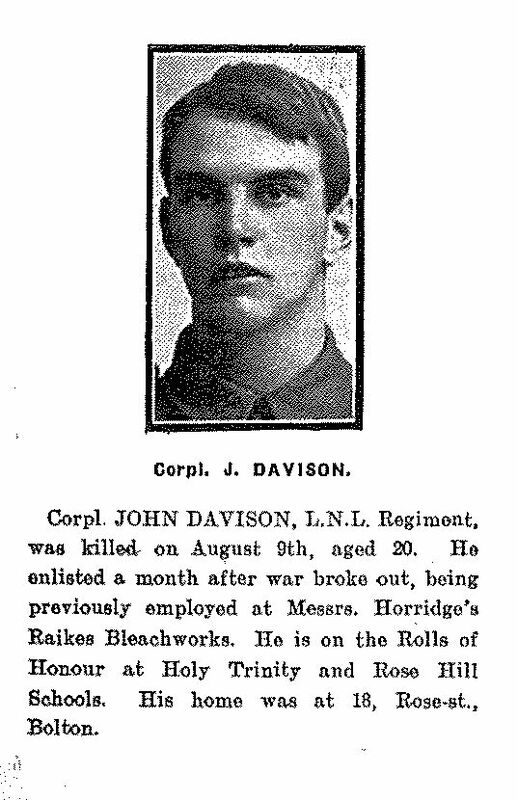 John, the youngest to enlist was also the first to die, losing his life on 9 August 1916 in France, aged 20. He had joined the 10th Battalion of the Loyal North Lancashire Regiment just a month after war broke out and had risen to the rank of corporal. William was with the 10th Battalion of the Lancashire Fusiliers and was killed in action on 12 May 1917, near Arras, where he is buried in the cemetery. He was 33 and married with an eight-year-old daughter, Mary Ellen. 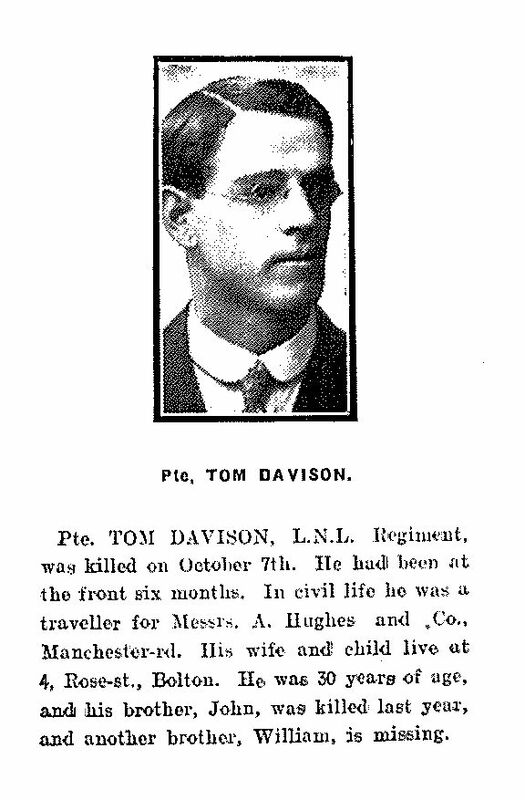 Tom Davison had been at the Front with the 10th Battalion, LNLR, for just six months when he was killed on 7 October 1917, aged 30. He is buried in Zonnebeke, Belgium. Tom had been a commercial traveller before he joined up and was married with a daughter Gwendoline, who was not yet two years old when he died. Youngest brother George was the only one to survive the conflict. Permission to use the article from the Bolton Journal courtesy of Bolton News.